Science is a beautiful thing, its truth is not based on opinion. Real science holds no place for tradition, dogma, or conjecture. When discussing science, one must differentiate between what is simply a myth, and what has been substantially proven. 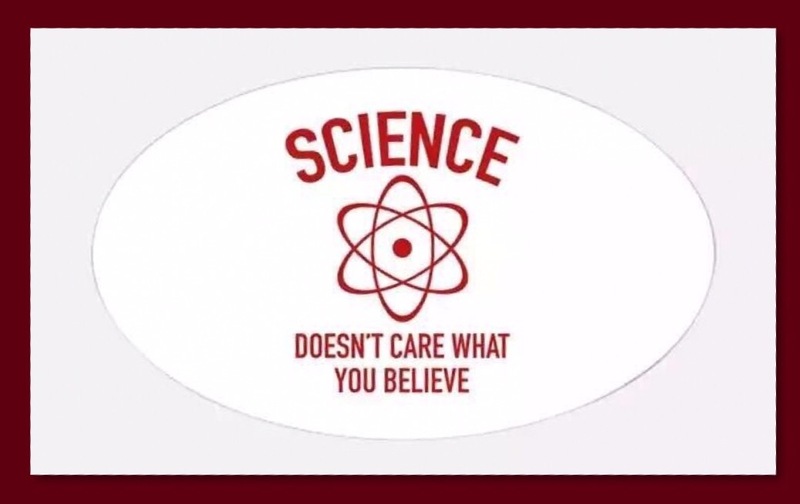 Honestly, science doesn’t really give a damn what “you believe.“ Science just is. The subject of nutrition has become a push button topic that evokes passionate arguments, not unlike that of politics and religion. The current obesity and diabetes epidemics have catapulted the topic of nutrition to the forefront of discussions. For the first time in the history of our country, the overweight to obese population has taken over as a majority, and still most are flummoxed as to why. Doctors are still telling patients to “eat less and move more,” while fearing saturated fat and cholesterol. Dietitians are still praising the benefits of “heart healthy grains,” and teaching us how to count calories. The general population just blindly falls into step with the 40 year old, outdated dietary guidelines that caused this mess in the first place. In this modern age of advancement, nearly every modality of science has advanced by leaps and bounds. Technology, communication, and industry have surpassed our wildest dreams in many aspects. Why then is it so perplexing that nutritional science might advance over the course of decades? This is a mystery that continues to confound me. 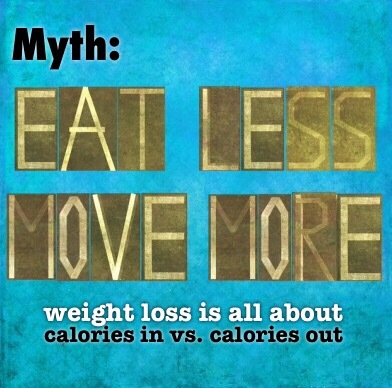 What follows are some of the more common misconceptions in the world of nutrition. You may have been challenged on these topics before. Although knowledge is power, some people need a little more proof in order to prompt their rethinking process. So for each of these myths, I have provided not only links to scientific studies, but I have included investigative articles, book recommendations and shareable videos as well. False. Weight gain/loss is driven by many factors beyond just simply energy/calorie balance. Hormones play a much more prominent role. This is completely false, different sources of calories go through different metabolic pathways in the body and activate different stimulus in regards to hunger, hormones, and brain function. An optimally healthy, or detrimentaly dangerous food item is not simply measured by its high or low caloric values. Several calorie sources such as added sugar and vegetable oils, can cause harmful effects on metabolism that have absolutely nothing to do with their caloric value. Veldhorst MA, et al. British Journal of Nutrition. Feinman RD, et al. Nutrition Journal. Johnston CS, et al. The Journal of the American College of Nutrition. Robert H. Lustig MD. Journal of the American Dietetic Association. False. Of the three macronutrients (fats, protein and carbohydrates), fats are least responsible for the storage of adipose fat. Even though fat has more calories per gram than carbs and protein, it is not any more fattening. 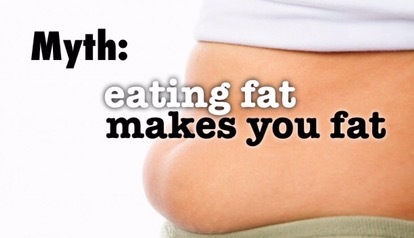 Foods that are naturally high in fat tend to satiate and reduce appetite. While carbohydrates and excessive protein both initiate an insulin response that promote fat storage. The studies consistently show that diets that are high in fat (but low in carbs) lead to much more substantial and sustainable weight loss than diets that are low in fat and high in carbohydrates. Westman EC, et al. Journal of Nutrition & Metabolism. Brehm BJ, et al. The Journal of Clinical Endocrinology & Metabolism. Yancy WS, et al. A randomized, controlled trial. Annals of Internal Medicine. Siri-Tarino, et al. The American Journal of Clinical Nutrition. False. There is no advantage to remaining in a feeding state throughout the day. 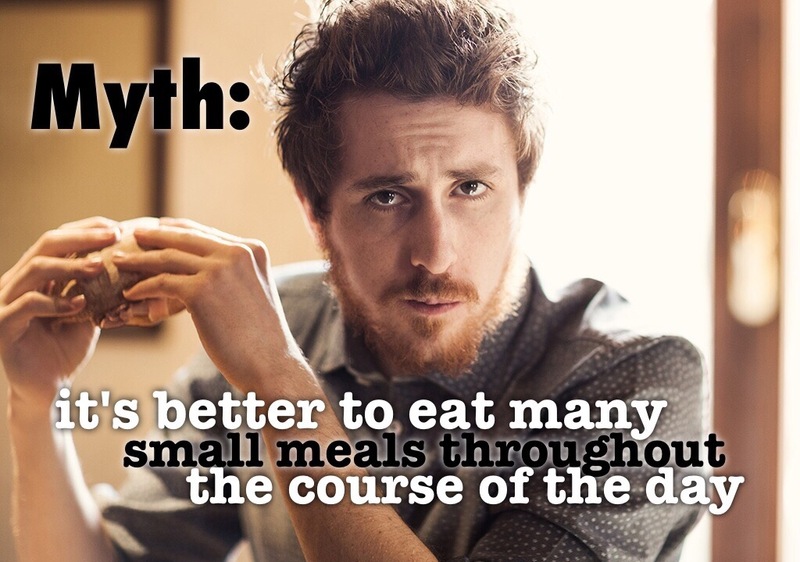 It is a myth that it is best to eat many, small meals instead of several bigger meals. The studies show that it doesn’t have any effect on health, body weight or increased metabolism. In fact, a case can be made that allowing your body to constantly remain in a feeding state can be counterproductive if weight loss is your goal. Cameron JD, et al. British Journal of Nutrition. Bellisle F, et al. British Journal of Nutrition. False. Sodium is an essential electrolyte that is necessary to sustain life. Even though sodium restriction can lower blood pressure, it does not appear to reduce the risk of heart disease or death. 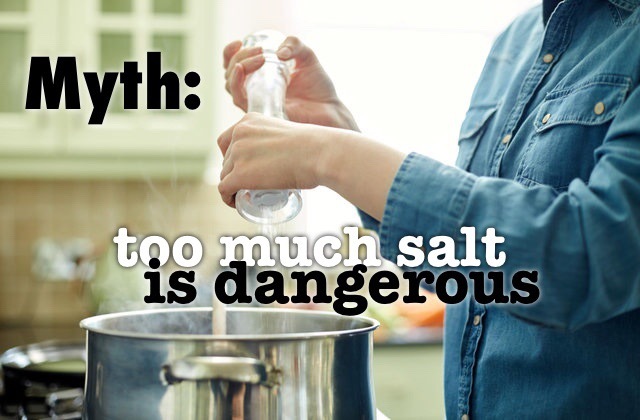 Several studies show that if you restrict sodium too much, it can increase risk factors for disease. There is no real science behind the 1500-2300 mg per day recommendation. Sodium is an essential electrolyte that is necessary to sustain life. Garg R, et al. Metabolism. Taylor RS, et al. Cochrane Database of Systematic Reviews. Jurgens G, et al. Cochrane Database of Systematic Reviews. False. The omega 6s and polyunsaturated fats of partially hydrogenated vegetable and seed oils are a dangerous source of transfat. There are two types of polyunsaturated fats, Omega 3 and Omega 6. It is true that Omega 3s reduce the risk of heart disease, but the same is not true for the Omega 6s. 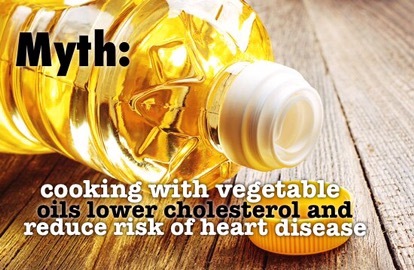 Even though the Omega 6s (soybean oil, corn oil, etc.) can lower cholesterol, the studies show that they actually increase the risk of heart disease. Recent studies have shown that dietary cholesterol is not a detriment to your health. Therefore, the advice to increase polyunsaturated fat, without regards to the type, is likely contributing more to the cause of heart disease than preventing it. Ramsden CE, et al. British Journal of Nutrition. Lands WE, et al. Annals of the New York Academy of Sciences. Ramsden CE, et al. British Medical Journal. False. Red meat is one of the most nutritious foods you can eat. It is loaded with vitamins, minerals, antioxidants and various other nutrients that can have profound effects on health. Though it is true that the consumption of processed meat is associated with an increased risk of disease, the same is not true of unprocessed red meat. 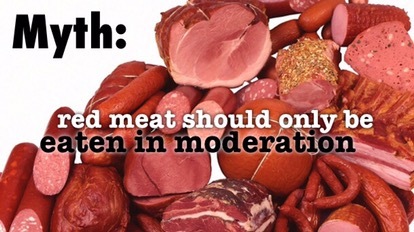 Though it may form harmful compounds if it is overcooked, unprocessed red meat is harmless. The answer is not to avoid red meat, but to make sure not to burn it. It should also be noted that the association between unprocessed red meat and cancer is highly exaggerated. Large review studies show that the effect is very minuscule in men and nonexistent in women. Alexander DD, et al. A critical summary of prospective epidemiologic studies. Obesity Reviews. Micha R, et al. A systematic review and meta-analysis. Circulation. Rohrmann S, et al. Results from the European Prospective Investigation into Cancer and Nutrition. BMC Medicine. Alexander DD, et al. European Journal of Cancer Prevention. False. Though the words “ketosis” and “keto-acidosis” both share the same root word “keto”, they have very different meanings. This is simply not true. 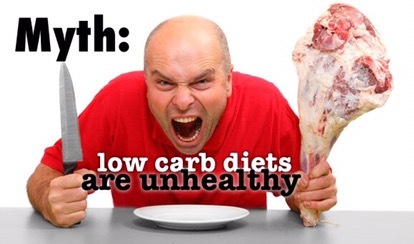 Since 2002, low-carb diets have been studied extensively, and over 20 randomized controlled trials have been conducted that attest to their safety. They consistently lead to improvement in regards to common health markers as compared to the typical low-fat diet. They result in more sustainable weight loss and improve most major risk factors for disease, including triglycerides, HDL, and blood sugar levels. Sidenote: Dietitians and other health care professionals often mistake the word ketosis for the word ketoacidosis simply because they have the same root word keto. Both words represent metabolic states, but that is all they have in common. One is dangerous, the other is not. For these people, might I suggest they seek some continuing education credits. Bazzano, et al. Annals of Internal Medicine. Westman EC, et al. American Journal of Clinical Nutrition. Hession M, et al. Systematic review of randomized controlled trials. Obesity Reviews. Santos F, et al. Meta-analysis of clinical trials. Obesity Reviews. False. Saturated fat found mostly in meat and full-fat dairy is not linked to cardiovascular disease, coronary heart disease, ischemic stroke, type 2 diabetes or overall mortality in healthy adults. This is a myth. 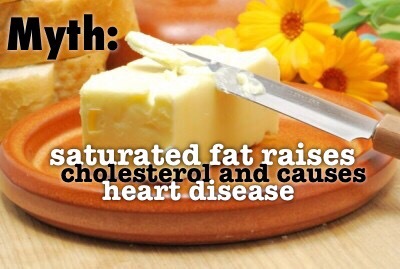 Saturated fat raises HDL (which some call the “good”) cholesterol, and changes LDL particles from small and dense to large, buoyant (benign) LDL particles, which does not increase the risk of heart disease. This has been intensively studied in the past few decades, and studies consistently show that saturated fat, as well as dietary cholesterol, are not contributers to risk for coronary heart disease. Siri-Tarino PW, et al. The American Journal of Clinical Nutrition. Mente A, et al. Archives of Internal Medicine. Dreon DM, et al. The American Journal of Clinical Nutrition. The low-fat diet has been put to the test in several huge randomized, controlled trials. It does not cause any weight loss over a period of 7.5 years, and has literally no positive effect on the prevention of heart disease or cancer. 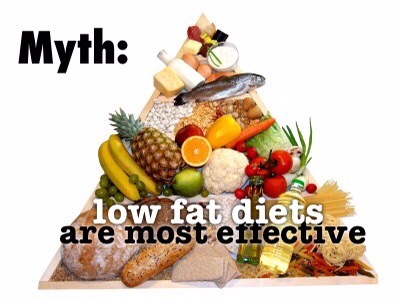 The low-fat diet is a huge failure, and likely a contributor to the development of many metabolic disorders. All major studies show that it doesn’t work for sustainable weight loss. Howard BV, et al. Journal of the American Medical Association. Multiple Risk Factor Intervention Trial: Risk Factor Changes and Mortality Results. Journal of the American Medical Association. 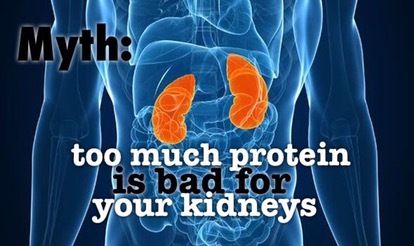 It is often claimed that a high protein intake can cause harm to the kidneys, but this is false. Even though it is important for people with pre-existing kidney disease to reduce their protein intake, the same is not true for people with healthy kidneys. Studies show that protein consumption has no detrimental effect on kidney function in healthy people … even in the case of bodybuilders who often eat large quantities of protein rich foods. Manninen AH. Journal of the International Society of Sports Nutrition. Martin WM, et al. Nutrition & Metabolism. False. Low fat dairy tends to have more sugar content than full fat dairy. There is no evidence that people benefit from consuming low fat dairy in place of full fat dairy products. In fact, the opposite is true. Low fat dairy is higher in sugar which makes this misguided advice seriously questionable. Full fat dairy (especially from grass-fed cows) contains important nutrients like Vitamin K2 and butyrate, which are often scarce in the average diet. High fat dairy products are actually associated with a lower risk of obesity. In countries where cows are largely grass-fed, people who eat the most high fat dairy products have a drastically reduced risk of heart disease. Smit, et al. The American Journal of Clinical Nutrition. Kratz M, et al. European Journal of Nutrition. Bonthius M, et al. European Journal of Clinical Nutrition. False. 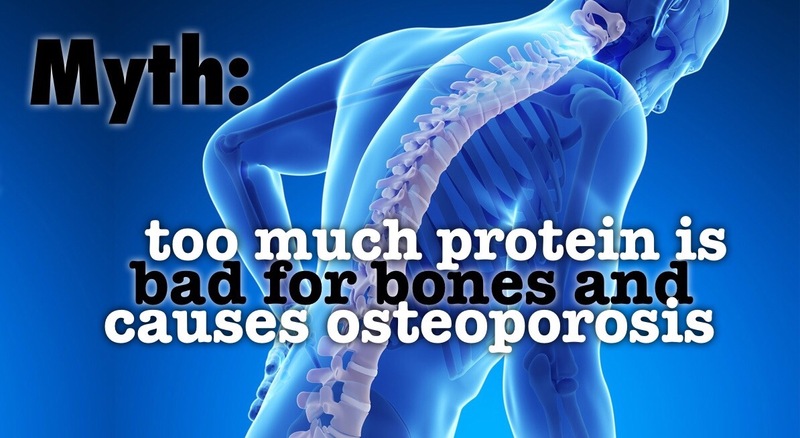 Depriving the body of protein is a detriment to bone health in the long term. Although it is true that protein can cause calcium loss from the bones in the short term, this effect does not persist in the long term. In fact, studies consistently show that protein actually improves overall bone health in the long term. Moderating protein intake is often advised in low-carb and ketogenic diets because of glyconeogenesis, not for the purposes of bone health or thwarting osteoporosis. Munger RG, et al. The American Journal of Clinical Nutrition. Kerstetter JE, et al. Dietary protein and skeletal health. Current Opinion in Lipidology. Bonjour JP. Dietary protein. The Journal of the American College of Nutrition. False. 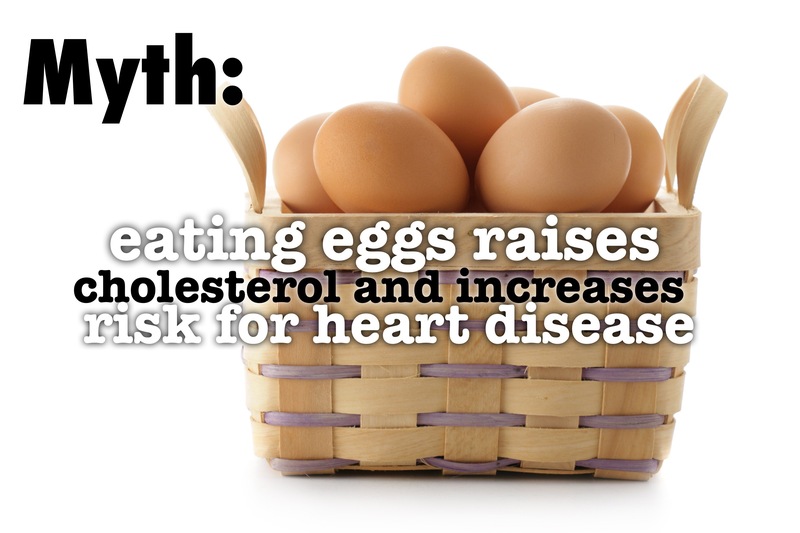 There is no correlation between the cholesterol in eggs and heart disease risk. Cholesterol contained in eggs do not raise the LDL cholesterol in the blood. It does, however, raise HDL ( considered by some the “good”) cholesterol. Eggs actually improve the overall blood lipid profile. Recent studies show that egg consumption is not associated with heart disease. Whole eggs are among the most nutritious foods available on the planet. Fernandez ML. Current Opinion in Clinical Nutrition & Metabolic Care. Blesso CN, et al. Metabolism. Rong Y, et al. British Medical Journal. False. The consumption of added sugar in our food supply is likely the single greatest contributor to the obesity/diabetes epidemic. 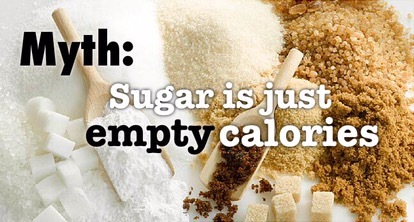 There is nothing empty about the effects that sugar has on your body. When consumed in excess, sugar can lead to harmful effects on metabolism, and cause insulin resistance, fatty liver disease, and various other metabolic disorders. Studies show that in the long term, high consumption of sugar is strongly associated with the risk of obesity, type 2 diabetes, heart disease, and even cancer. Fung TT, et al. The American Journal of Clinical Nutrition. Stanhope KL, et al. Journal of Clinical Investigation. Stanhope KL, et al. Current Opinion in Lipidology. Ludwig DS, et al. The Lancet. Schulze MB, et al. Journal of the American Medical Association. Bostick RM, et al. Cancer Causes & Control. plenty of research suggests cholesterol is extremely beneficial.. Excellent article – I’ve shared this! Excellent article, will share and share again.